When you’re moving, changing your address seems like a pretty straightforward item on your to-do list. And in many ways it is. But simplicity can be deceiving, and there are pitfalls to avoid. This is easy enough, though, if you simply know where and when to change your address. We’ve broken the list of necessary address changes into four categories, based on how urgent they are. We’ve done our best to keep it simple. But remember that if you’re not careful and thorough, you could miss important steps in the process, opening yourself up to scams and fraud down the road. Moving makes you vulnerable to change-of-address scams because in the shift from one home to another, it’s easy to miss important mail or not notice that things are missing. One thing you’ll notice pretty quickly when changing your address: Many places make it incredibly easy, especially with online address changes. This is convenient for you, but also for all the scammers out there. WNYT in New York recently told the story of Claire (not her real name), whose very alert mail carrier noticed that a change-of-address request had been filed for Claire and suspected, correctly, that Claire had not filed it. In this common scam, the fraudster files a change of address at the post office or on its website in your name. They then take out credit card applications in your name and have them delivered to the new address. Or they could simply wait for your monthly bills to arrive and get all sorts of personal details, making identity theft a breeze. To combat this, USPS will send a confirmation of the change of address to both addresses, in the hopes that you’ll receive one of them and alert USPS if it’s fraudulent activity. 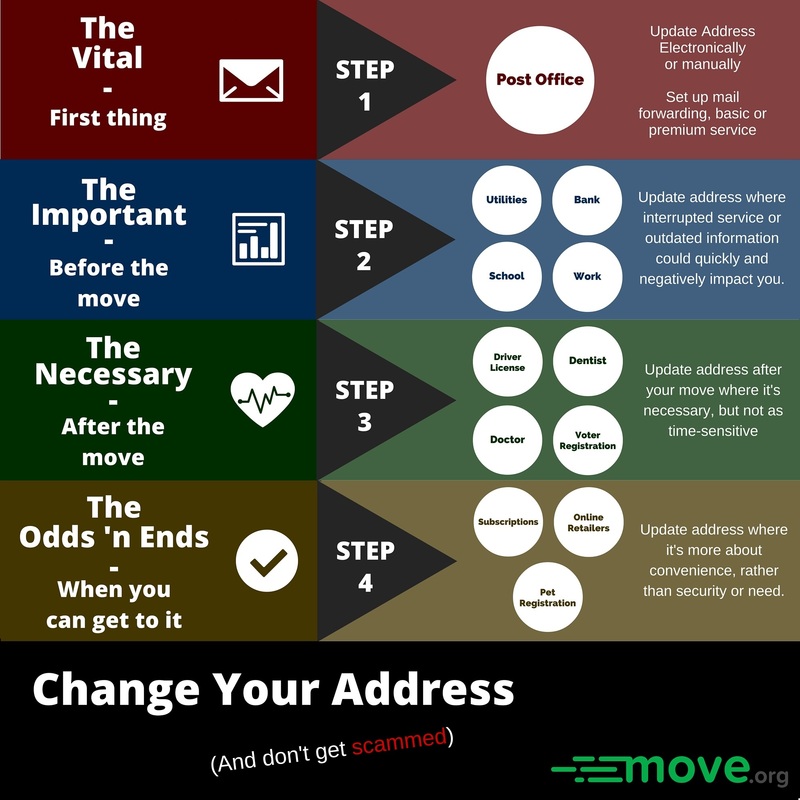 Now that you know to be vigilant about change-of-address scams, don’t get carried away! In March of 2015, the IRS had to go to media to verify that yes, they were mailing requests for some people to verify their identities at the IRS website. Because of the prevalence of mail scams, many people reasonably assumed that the letter they received was bogus. We always advise caution when someone is asking for your personal information. But unless you’re being contacted by a Nigerian prince, you may want to make a phone call or do a quick Google search to see if what you’ve received is the real deal. Update your address electronically or at the local post office. Set up mail forwarding. The basic package for $1.05 is recommended in most cases. The post office is your first stop. File a change of address and set up mail forwarding. This can all be done online for just $1.05. Your mail will be forwarded for up to a year. There is a premium service available for $18.65/week, but most people will only need the basic service. Remember, in order to combat scammers who attempt to change your address in your name, USPS will send a confirmation card to both the new address, and the old one. Claire likely received a notice of the change of address, but may not have been paying attention to what she thought was junk mail. Check your mail thoroughly every day so you’ll know about a fraudulent change of address and you can immediately call your local Postal Inspector to let him or her know of the scam. Similarly, if you’ve filed for a change of address, watch your mail carefully to be sure you received the confirmation notice, and that the new address is correct. Change your address at your bank. Because of the prevalence of online banking technology, it can be easy to forget this step until it’s too late to avoid an embarrassing situation with a declined card. Insurance rates will usually change based on your ZIP Code, so tell your insurance company as soon as you can. As Claire found out in the above story, there’s a lot of sensitive information that gets sent regularly by both banks and insurance companies. If you have kids, notify their current school that they’ll be leaving, then enroll them in their new school as soon as possible. If you draw Social Security or other government benefits, let that office know of the address change before the move to ensure you won’t have an interruption in your benefits. Even if you’re leaving your current employer, be sure to update your address with them so your next W-2 form goes to you, not a potential fraudster. Also, if you’re a member of a professional organization or regulated industry, you may be required to update your address to retain membership or keep compliant. Items in this category may not cause huge problems if you don’t get to them right away, but that doesn’t mean you can write them off forever. Most states have a grace period of, say, 30 days after moving into the state before you must by law have an updated driver’s license. The same rule usually applies for in-state address changes, too. So don’t stress about changing your address at the DMV until after you’ve taken a few days to settle into your new place. Change your address with your doctor and dentist, or simply ask them to take you off their rolls if you’ve moved out of town. Now is also a good time to ask for any recommendations in your new town. If you never get around to the items in this list, it’s not likely to seriously affect your security, but it could cause some inconvenience later. Even if you aren’t at immediate risk of identity theft, there’s really no reason to tempt fate. Even something as seemingly harmless as an old magazine subscription going to the wrong place could let someone know that you’ve recently changed addresses and are in a vulnerable position. So even though these aren’t on the more vital lists, it’s important not to forget about them. Don’t forget to let your family and friends know that your address has been updated! Send a change of address card in the mail or by email. In fact, if you’re planning a housewarming party, this is the perfect time to give your new address to attendees by sending an invitation either by mail or electronically. If you’ve moved away from family and friends, then use the housewarming party as a chance to get to know your new neighbors. While you’re at it, make some new friends who, like Claire’s mail carrier, can keep an eye on your mailbox when you’re away from home.